As this winter has been quite a harsh one, with the recent snow and freezing temperatures, it has all been quite tough on my skin. Having combination skin is difficult in balancing out the right things to put on it, and being a student has made it even harder finding good quality products this year! When it comes to cleansing, my face in particular is very sensitive. I tend to suffer from spots, and I need my face to feel as clean as possible to control it. In the morning, I use Cetaphil Gentle Skin Cleanser. It’s described as a ‘gentle’ cleanser for sensitive and dry skin, which is perfect for me at the moment, as the weather has made my skin very dry in places. I also think that it’s good for removing makeup, which is a bonus for me.It doesn’t have that ‘just washed’ feeling that a soap would usually have on your skin once you’ve washed your face, which I do tend to miss. It’s not a product you can get very easily either; you can’t walk into a supermarket or a shop like Superdrug and buy it, as I have to order mine from Boots and then collect it in store. As a daily cleanser however, it’s perfect for my skin as it’s non-irritating and balances the oily and dry areas when my spots appear. If my skin is really dry, then I like to use an exfoliating scrub to get rid of the dead skin cells. My favourite is Soap & Glory’s Scrub Your Nose In It. It’s also coincidental that I suffer from very dry skin on my nose at the moment, so it works well with combatting that. It’s specifically for your t-zone, so I like to leave it on my skin longer in places where I suffer with spots – the packaging recommends 3 minutes. This way, you essentially get a 2 in 1 cleanser; face mask & exfoliating scrub. Once it’s washed off, my skin is soft and smooth. I couldn’t say anything negative about this product; it even has a minty freshening smell. When I’m taking my makeup off at the end of the day, I like to use Simple’s Clear Skin Oil Balancing Cleansing Wipes. When it comes to getting makeup off my face, if I’m using an own brand face wipe I usually have to use at least two. It can still feel like they haven’t removed all of the makeup, which I find a waste. Other wipes like Neutrogena’s, for example, give a burning feeling on my skin and it stings quite a lot. I find Simple’s are just right, as they have a fresh smell and get my makeup off without hurting my skin. To keep my skin hydrated, my favourite body moisturiser of the moment is Soap & Glory’s The Righteous Butter. I love the amount of product you get in the tub, and the smell is amazing! It’s very unique; maybe not for everyone, as it is quite a sweet smell. However as a moisturiser it is very hydrating. It’s described as a ‘very dry skin formula’ which I can agree with, as my skin is smooth and soft for hours. However, as it was a Christmas present, I wouldn’t buy another tub straight after I’d ran out of it. Even though I do love the product, it’s around £10 and I would probably pick up Palmer’s Cocoa Butter instead which is half the price. To me, as a student, it is a luxury. 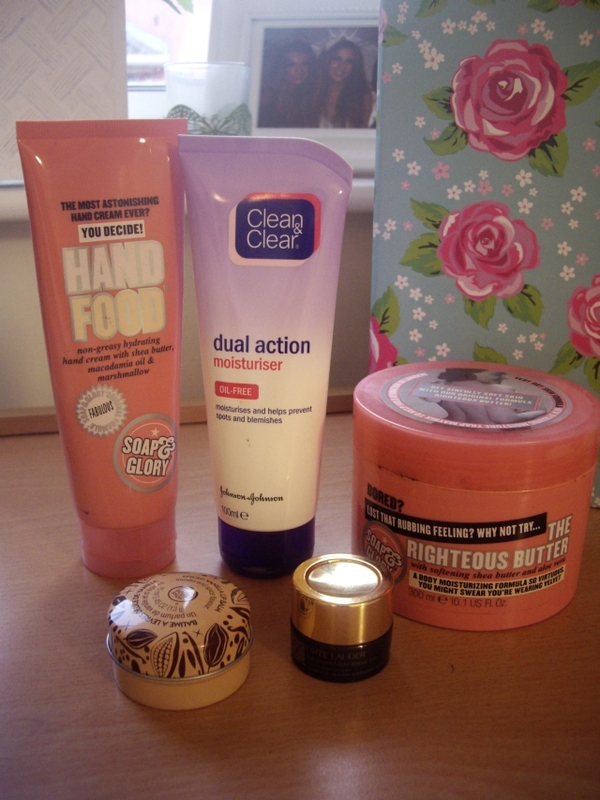 For my hands to be nice and nourished, I use Soap & Glory’s Hand Food. It claims to be ‘non-greasy’ which is true in my experience. My hands don’t slide everywhere and they smell lovely. It’s a similar scent to their Righteous Butter, but more subtle with an undertone of marshmellow. I have the full sized version, but I definitely think their travel size would be perfect to keep in my bag. As a daily moisturiser that I use after cleansing, I have used the same product for many years and would never go elsewhere. I use Clean & Clear’s Dual Action Moisturiser. Clean & Clear are known for their acne related products, and when I suffered from acne as a teenager this moisturiser never made my skin any oilier. It keeps my skin balanced, and has always worked for me. My absolute favourite lip balm of the moment is The Body Shop’s Spiced Vanilla Lip Balm. It’s limited edition, specially for Christmas, and has a really festive smell. I love The Body Shop lip balms, and theirs are a general favourite of mine as they’re moisturising and stay that way for a while on the lips, but this is one that I can’t stop using. My final favourite is one that is very high end, and is no surprise that it is a sample size. Estee Lauder’s Advanced Night Repair Eye is what I find really helps brighten my eyes after a huge lack of sleep! I pop it on underneath my eyes before I go to bed, and the bags under my eyes don’t feel as big. I would love to own this at full size, but at over £30 for a 15ml bottle, it’s definitely something I can’t afford! I would love to find a cheaper alternative, so I need to do my research. Next Post MAC Studio Fix Fluid or Revlon Colorstay? I use spell checker on all of my posts. I haven’t found any spelling mistakes in this post. Usually it’s triggered by the fire displayed in the article I read. 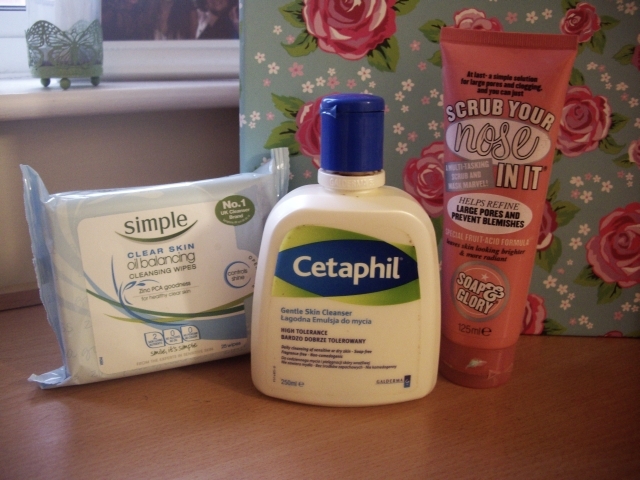 And on this article My Current Favourite Skincare Products | blushbeauty. -P I actually do have 2 questions for you if it’s allright.